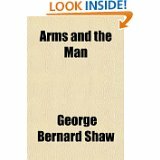 This is a study guide for the book Arms and the Man written by George Bernard Shaw. Arms and the Man is a comedy by George Bernard Shaw, whose title comes from the opening words of Virgil's Aeneid in Latin: "Arma virumque cano" (I sing of arms and the man). Please click on the literary analysis category you wish to be displayed. Back and Next buttons can guide you through all the sections or you can choose to jump from section to section using the links below or the links at the left.